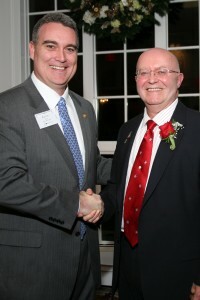 LYNNFIELD Northrup Associates is pleased to announce that Bert Beaulieu, REALTOR and Sales Associate with Northrup Associates was officially installed as the 2010 President of the North Shore Association of REALTORS (NSAR) by Kevin Sears, 2010 President of the Massachusetts Association of REALTORS (MAR). Beaulieu will officially assume the duties as NSAR President on January 1, 2010. As President, he will direct the internal and external activities of the Association; preside at all meetings of the NSAR; act as the official spokesperson for the Association on issues related to the real estate industry; and represent NSAR members on the MAR Board of Directors. The North Shore Association of REALTORS is a leading local real estate association in Massachusetts serving over 1,200 members and representing more than 230 sales offices on the North Shore. This event was held at the Tupper Manor at Endicott College in Beverly and hosted over a hundred REALTORS, affiliates and guests from the North Shore. The evenings Gold Sponsor was Northrup Associates and proudly included nearly all of its REALTOR associates at the installation. With nearly 60 years of business, Northrup Associates prides itself as an office that encourages strong ethics, service and professionalism, Berts professionalism and dedication to the REALTOR organization has made him a valued and trusted real estate resource for the North Shore community and we are proud to have him as a contributor to the overall success of Northrup Associates, said Richard Tisei, Broker/Owner of Northrup Associates.